How romantic! Red roses that will never fade … the perfect gift for your Valentine. 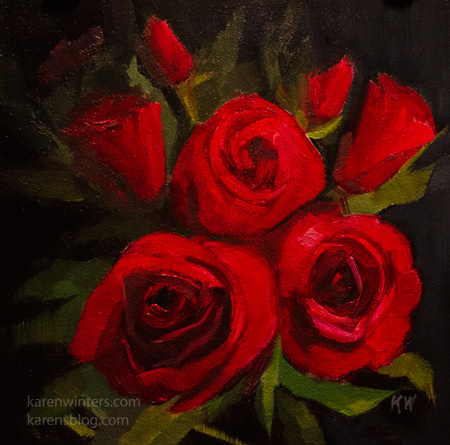 These roses were given to me one Valentine’s Day by my own sweetheart … so I painted them to keep the love going. This painting is available framed, if you like. Shop now to have it in time for Valentine’s Day. 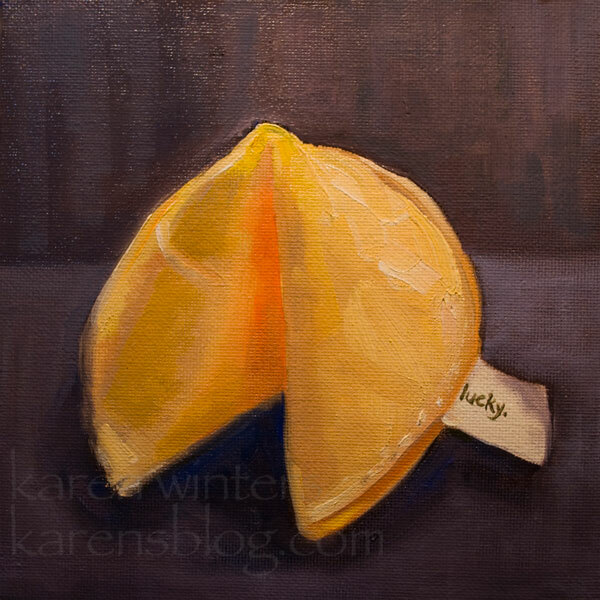 Add a little luck to your life with this miniature (6 x 6″) original oil still life. 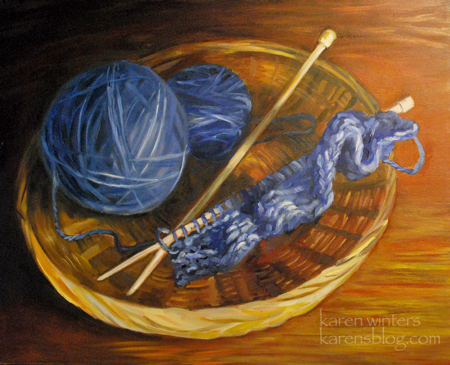 This painting was a pleasure to paint for a client as a Christmas gift for a family member, portraying the items the person uses in pursuit of her favorite hobby, knitting. Although I had not painted knitting before, I felt confident that I could do it, because, after all, painting basically comes down to seeing shape, color and value. You don’t think about painting a ball of yarn, a straw basket or a soft bit of knitting, you think about how light interacts with a surface, how the form turns and how the colors work together. The first challenge was assembling the materials that would represent the colors the knitter liked best and the type of yarn she liked. A local fabric store made that part rather easy. The second hurdle was a little harder. I decided that I didn’t want to just position a few needles with a ball of yarn, but that I wanted a sample of knitting to go with it, as though the knitter had been interrupted in her work. 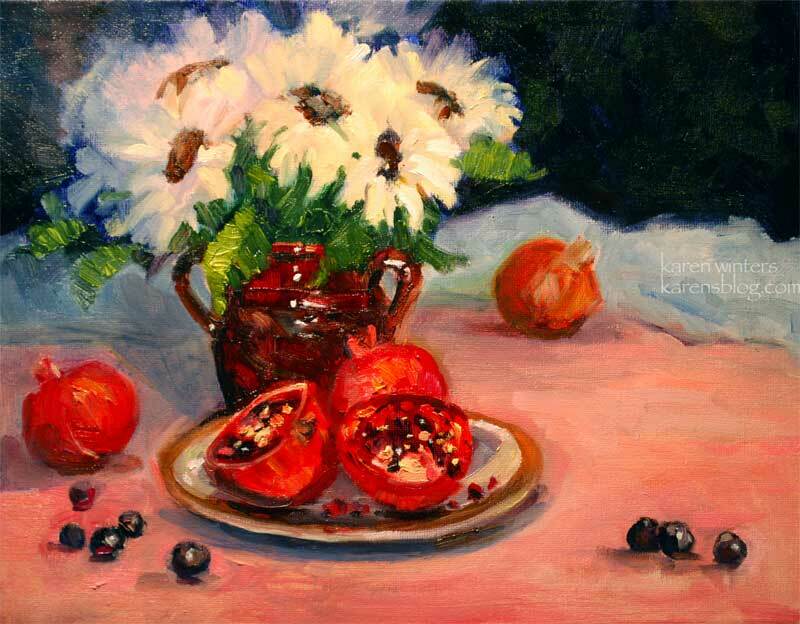 Because the painting is to be a surprise, the client could not ask the person for a sample – so I had to remember what my grandmother had taught me so many years ago to produce the small sample. Surprisingly, the technique came back to me right away. Next came the challenge of arranging the still life into what I felt was an interesting relationship of diagonals and curves – both in the needles and the spokes of the basket … incorporating the rhythmic line of the knitting as well as the individual strands of yarn that connect the balls of yarn to the piece of work. Because the yarn had to be blue, I chose supporting elements that would be in the orange and brown range for a complimentary color scheme. Finally, came the fun of painting the setup – from the block in to refinement of shapes to final details. Here’s a closeup of one part. I used a very small sable brush in the last layers to suggest the wispiness and softness of the fibers of the yarn. 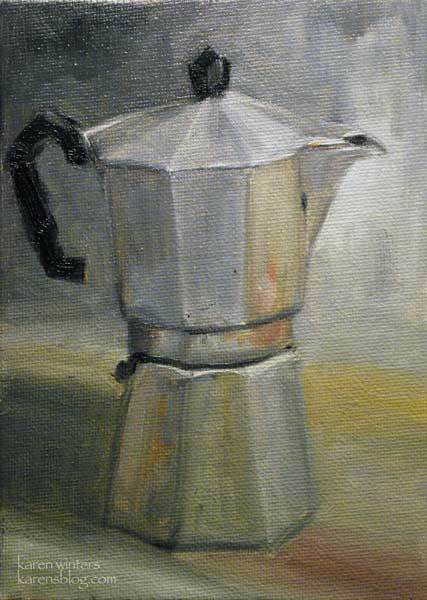 There was a time when I could drink espresso any time, day or evening after dinner and fall asleep like a baby. Well, a sleepy baby, not a cranky crying baby. My espresso drinking days may be over unless I can find a decaf drip. I would imagine Starbucks has something of that sort, too. Christmas Blend ground for expresso sounds pretty darn good, in fact. With steamed skim milk and a dash of hazelnut flavored syrup. Yum. Anyway, this is our old espresso pot which has seen better days, but has been well loved and used. It hung by the handle off of a pot rack and hit the floor once, but it kept working just fine although a bit misshapen. 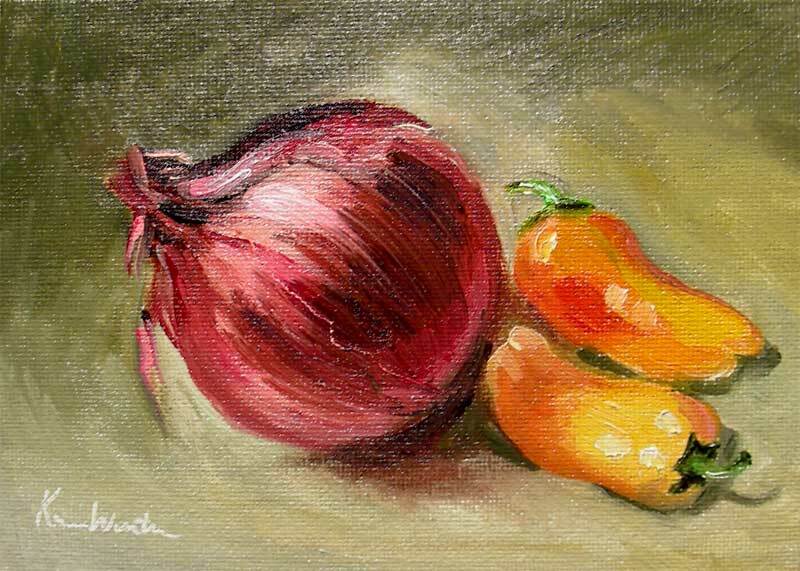 This little painting started out as a study to see how i could render the different facets of the aluminum vessel using an Anders Zorn palette of white, black, yellow ochre and cadmium red. The brilliant but delicate iceland poppies form a backdrop for the mandarin oranges. Or perhaps they were tangerines or clementines. I can never be sure about citrus. 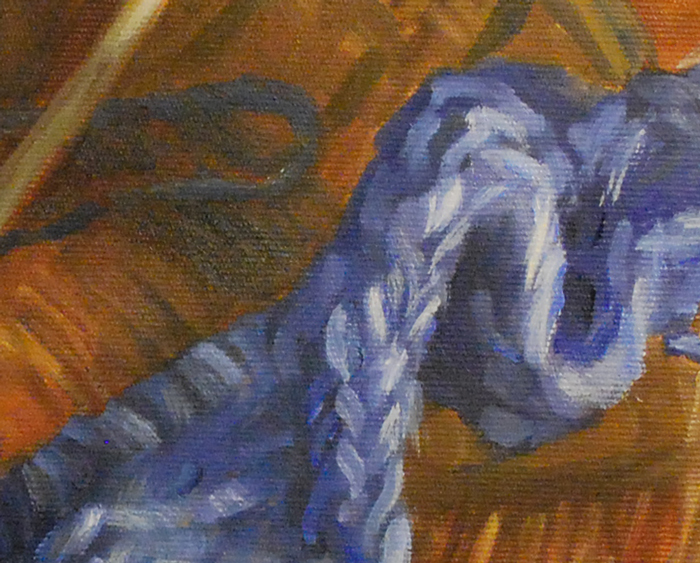 There is some glare on this painting because it’s soaking wet, but I hope it conveys the general idea. I’ll shoot another picture in a week or so when it is dry. It has been pouring rain here, which we dearly need. Tomorrow morning I hope that I wake to see snow on the Angeles Crest mountains. If so, it will be a good day to go out and paint a rare scene. These mountains are infrequently dusted, and sometimes subsequent rains wash it away if there’s not sufficient cold. Blue skies, white snow and a few scantily-clad sycamore trees still holding onto their leaves like fan-dancers protecting their modesty. Brrr. I was interviewed yesterday on Creative Liberty, a wonderful blog about living creatively. Liz Massey, the blog owner and a creative coach asked me some good questions for her “In the Studio” series, and I enjoyed the opportunity to talk about my work flow, staying “unblocked” and keeping my creative fires lit. Click the “creative liberty” link to read it. 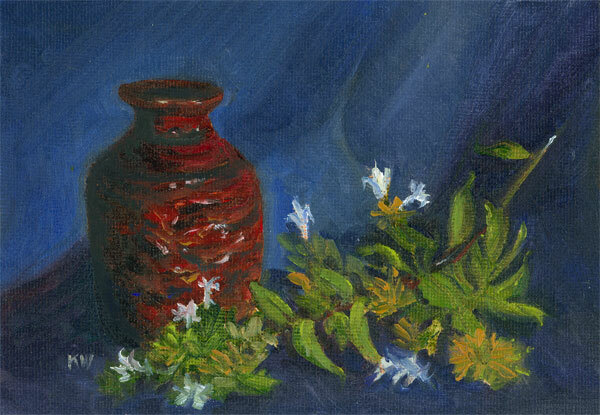 A small study of a vase with a sprig of abelia from a bush blooming outside our door. Painted from life. I’m off to a nocture paintout this evening, which should be an interesting challenge. I’ve scouted the location and know what to expect, generally, but lighting is always a surprise. This past week I’ve been trying to spend some time catching up and decluttering my studio. It’s easy to let things get out of control when painting on deadline and doing the multitude of other things that an art business involves. In the act of sorting, filing and calendar updating I gain a greater feeling of control and relaxation and in a small way, I almost look forward to that time. Order … tranquility … letting the mind settle quietly. Gotta run … more later. Remember how I said I was watching more food network and less politics for the moment? 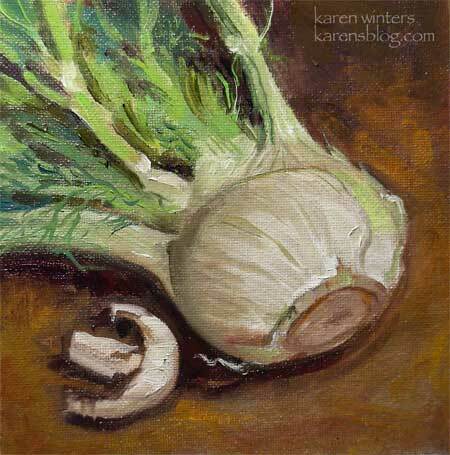 As part of that trend, I’ve enjoyed shopping for some vegetables I don’t usually prepare, among them, fennel. This delicate vegetable and its companion mushroom called for a quick portrait before their trek to the salad bowl, and I obliged. This is the first in a series … more Tuscan Flavor still lives to come. Oooh, this means more shopping, doesn’t it? After months of watching virtually nothing but election news on TV and radio, I decided that I am finding the whole thing too stress producing and have switched some of my viewing habits to Food Network. Yeah, I still keep tabs on what’s going on, but I no longer choose to have political speak as the soundtrack for my life. With that influence, I’ve probably seen more closeups of peppers and onions and garlic cloves in the past week than I have in years. And they’re really fun to paint, too! So here’s a closeup view of some ingredients headed for the chopping block. Get em while they’re hot … the pepper, that is. Rather, this is the sunshine we WISH we had right about now. It’s been cold, wet and lightning is promised tonight. But I really can’t complain because this sort of weather is such a rare event and the gushing streams and wildflowers that follow will be glorious. In the meantime we’ll just snuggle up with an extra comforter and umbrella and wait until the sun breaks through. Doing a painting like this is an entirely different experience from some of the bolder more expressive things I’ve posted recently. I’m not abandoning any style at the moment, I’m just exploring a range of techniques and looks. Painting something like this is a very quiet, meditative experience – using a smallish brush and taking quite a bit of time. 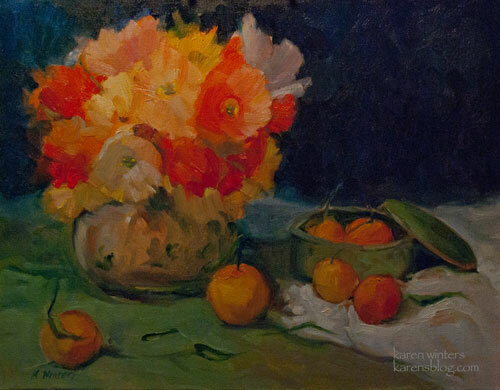 Painting something like “Tumbling Down” for example, is an invigorating emotional experience, using a large brush and painting impulsively in a short period of time. They’re just … different experiences and sometimes one fits my mood more than another. You think maybe it has to do with caffeine? Hmmm … now there’s one to think about. Edited to add: an art friend asked how I got the spotted effect in the lemon and how I did the edge of the lemon where the white of the paper is the bright spot. 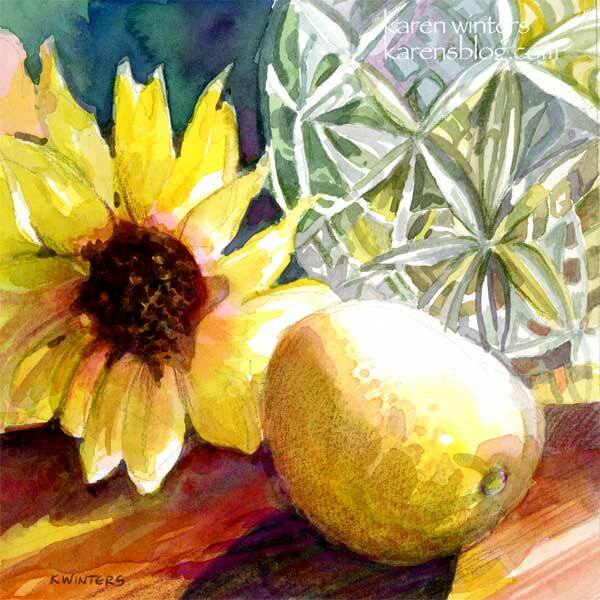 The lemon was painted with multiple glazes of transparent watercolor – up to 5 layers, if I recall correctly. (Sometimes I forget when I’m in the flow of the moment.) The final glaze was a very pale orange and the uppermost spots were touched in with the tip of a small brush. The rougher spotty texture (toward the bottom of the lemon) comes from using a very light layer of colored pencil in the darks. The edge at the top of the lemon, where it meets the crystal, was just “painted around.” No masking was used.